It’s true – it doesn’t have to cost a thing. You need more inbound calls. More opportunities to make more sales. More prospects for additional revenue. Obviously, that’s why you are reading this. “How do I do this? !” you’re asking. Ok, I’ll get to the point. It’s very simple, actually. Find a magic lamp, rub it three times, and make your wish to the genie! OK, OK, it’s obviously not that easy. Improving your business takes work and a bit of effort. You already know that; we know that. So, with the same effort, how can you effectively start receiving an influx of inbound calls? Invest more marketing dollars into the avenues that are generating more inbound calls, and nix the ones that are under-performing. It sounds pretty obvious, right? But how do you know how to make these crucial decisions? By tracking your calls, you can quickly and easily see which marketing source(s) are driving the most phone calls. By evaluating your data over time, you can identify any trends and get a large enough sample size of data to determine what really is and is not working for you or driving true prospect calls into your office. Let’s look at a real-world example from a CallSource client. A hearing clinic was looking to generate more prospects without spending any additional marketing dollars. Because of course, you can always try to throw money at the problem and hope that works, but data-backed results work better—don’t you think? This clinic has been a CallSource client for a number of years, so they had a great size of data to look back on. Since CallSource’s reports provide marketing transparency without an agenda, they were able to ensure that their marketing spend wasn’t being spent on underperforming marketing tactics. The hearing clinic first wanted to verify if the advertising campaigns that they thought were strong performers were actually yielding the best returns. Determining how much a quality lead costs you across each campaign will allow you to weigh your return on investment of your marketing dollars. 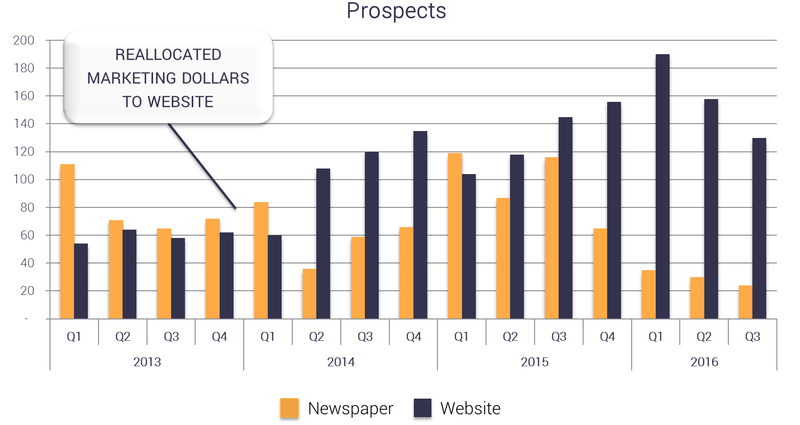 Through CallSource’s metrics, the hearing clinic was able to identify that their newspaper campaign wasn’t returning as strong of a result as it had in the past (see graph below). Once they realized this, they decided to reallocate the money they were spending on the newspaper and apply those dollars into their website instead. By reallocating this spend; they were able to generate more leads without spending any more money. Do you know what your top-performing marketing sources are, or do you just think you know? When it comes to improving your business, don’t leave it to guesswork. If you want to get more calls, and therefore more business, you will have to utilize real, unbiased data for your business to increase sales. Please comment below with any additional tips or questions of your own. If you are interested in learning more, feel free to reach out to a CallSource Representative. We can’t wait to hear about how you improve, too.